For my first flashback Friday I wanted to go back, WAY back. Casey and Chanel are not big stars here on L.A.I.D. much anymore so I thought I'd spotlight my first "baby" today. She was so tiny and so soft and so silly. 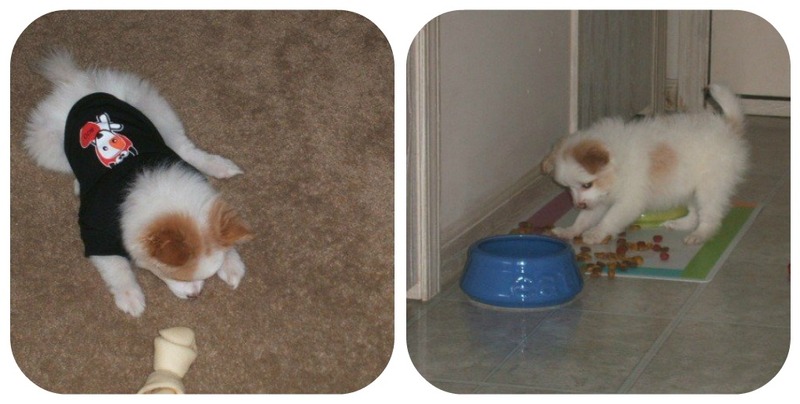 She still is silly and she still sleeps just like she is in that top picture, legs straight out. I love this little dog to pieces. Omg, she is just adorable! I would love a little dog like that, but Andy would never go for it. If we ever get a dog, it will be a big one. Lol...oh well, I can dream. okay i just let out an actual *awwwwwww* & so did my 2 year old daughter! obviously all of your babies are abundantly cute! Omigosh. SOOOO cute :-D I've been trying to convince Greg that we need a little pup... but it's not going over so well. Honestly and unfortunately, I think our home is a little too small for two cats and dog though. CUTE! Be still my heart! So adorable! omgsh!! i love her! shes adorable! tico will ALWAYS be my first baby. couldnt imagine my life without his little furriness. it also scares me to death thinking about how obsessed i am with my DOG - i can only imagine how obsessed i will be when i have a real skin baby! eeeek! I LOVE this! She is SO SO cute!!!! I feel like my poor dogs have really gotten the shaft on pictures and mentions since Trey has gotten here. Awww, how cute! Part pom?